(AP) MIAMI - Calling the honor "overwhelming" but pointing to a "bigger goal," LeBron James on Saturday became the eighth player in NBA history to win the MVP award three times. James accepted the trophy and will get to show it off to Miami Heat fans Sunday afternoon when he's presented with the prize again by Commissioner David Stern before Miami faces Indiana in Game 1 of an Eastern Conference semifinal series. "Heat nation, we have a bigger goal," James said. "This is very overwhelming to me as an individual award. But this is not the award I want, ultimately. I want that championship. That's all that matters to me." James won the award for the third time in four seasons. Only Kareem Abdul-Jabbar, Michael Jordan, Bill Russell, Wilt Chamberlain, Larry Bird, Magic Johnson and Moses Malone have won at least that many MVP trophies. Abdul-Jabbar won six times, Jordan and Russell five times each, Chamberlain four times. Now, they're the only players with more than James. "We love you," Heat President Pat Riley told James during the ceremony. "Not just because of this, but because of what you mean to our organization." James received 85 of a possible 121 first-place votes from a panel of sports writers and broadcasters who cover the league, as well as one collective fan vote on NBA.com. He finished with 1,074 points, topping Oklahoma City's Kevin Durant (889 points, 24 first-place votes), the Los Angeles Clippers' Chris Paul (385, six first-place votes), the Los Angeles Lakers' Kobe Bryant (352, two first-place votes), and San Antonio's Tony Parker (331, four first-place votes). James credited several of the league's best players for being part of his inspiration to play at the highest level. 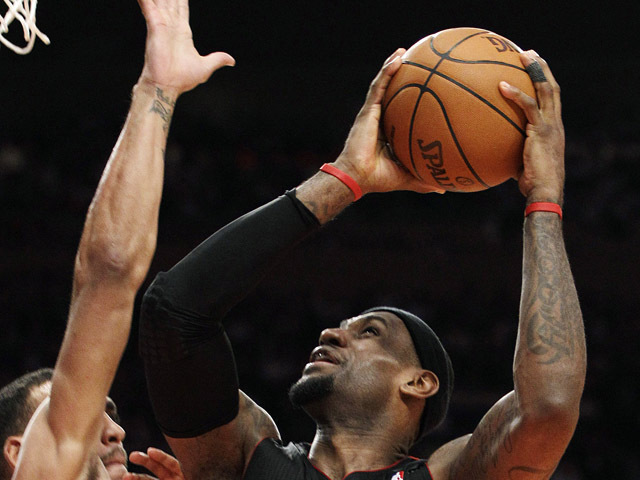 "We do not take LeBron James for granted, not here in this organization," Heat coach Erik Spoelstra said. And he apparently does not take the organization for granted, either. James' voice broke a couple of times as he spoke, and he confessed he was more nervous than he anticipated. James relayed a story about his reaction when the news broke publicly Friday night, telling family he was with at the time that "this is crazy." "I see my two sons, I do what I do and I try to perform at the highest level every night, and a big part of the reason is those guys. I don't want to let them down," James said, pausing for a brief moment as he looked at fiancDee Savannah Brinson and his sons. "Secondly, my teammates, like I said. The reason I'm up here today is because of those guys. If those guys don't sacrifice what they sacrifice every single night ... I wouldn't be up here." Moments later, he asked the entire Heat roster to join him on the stage, and they huddled behind him. "These 14 guys right here, they give everything," James said. "And they give me everything." James averaged 27.1 points, 7.9 rebounds and 6.2 assists  making him only the fourth player with those totals in at least two seasons, according to STATS LLC, joining Oscar Robertson (five times), John Havlicek (twice) and Bird (twice). Add James' 53 percent shooting and 1.9 steals per game into the mix, and the club gets even more exclusive. Only Jordan had a season with numbers exceeding what James did this season in those categories  1988-89, when he averaged 32.5 points, eight rebounds, eight assists and 2.9 steals on 54 percent shooting. "It's amazing to think about it in that sense  three in four years," Heat guard Dwyane Wade said. "And there could have been one last year. It just shows how great of a talent, how great of a player that he is. Obviously, as an organization, we're excited, especially coming off of last season and everything that happened and was said." Many in the Heat organization thought James should have won the award a year ago as well, when he dealt with constant fallout from "The Decision" to leave the Cleveland Cavaliers as a free agent and sign with Miami, where he, Wade and Chris Bosh formed a "Big Three" that has been celebrated at home and reviled in just about every other NBA arena. James has said he played more out of anger and to silence criticism than anything else last season. So this season, his mindset changed, with him trying to revert to old ways, first as a superstar-in-waiting at St. Vincent-St. Mary High School in his hometown of Akron, Ohio, then during his seven seasons with the Cavaliers. "I wanted to get back to who I was as a person," James said. It's the first time the Heat hosted an MVP celebration. Shaquille O'Neal won his only MVP award before coming to Miami, and James won the 2009 and 2010 trophies with the Cavaliers  receiving 225 of a possible 244 first-place votes in those seasons. The NBA MVP trophy is named for Maurice Podoloff, the league's first commissioner. Heat assistant coach Bob McAdoo won the award for the Buffalo Braves in 1975. McAdoo said James had to deal with "absolute hate" last year over his decision to leave Cleveland sign with Miami, and some believe the repercussions kept him from getting as many MVP votes as he may have deserved a year ago. "He's already a Hall of Fame player. That's in the bag," McAdoo said. "If you ask him, a world championship or an individual award, he'll take the world championship every time." That quest will resume Sunday, shortly after Stern hands James the MVP trophy for a third time. "I'd give all three of them back for an NBA championship," James said. "It's all I care about. It's all I know."